Benin, formerly known as Dahomey, is one of Africa’s most stable democracies. Benin’s shore includes what used to be known as the Slave Coast, the departure point for captives to be shipped across the Atlantic. Elements of the culture and religion brought by slaves from the area are still present in the Americas, including voodoo – which has made a comeback in Benin and is even celebrated at the country’s annual Voodoo Day. 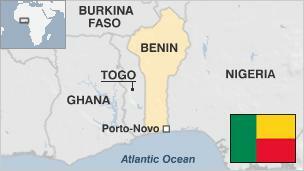 On the economic side, however, the picture is less bright – Benin is severely underdeveloped, and corruption is rife. While the country has experienced economic growth over the past few years and is one of Africa’s largest cotton producers, it ranks among the world’s poorest countries. To the north, there have been sporadic clashes along Benin’s border with Burkina Faso. The trouble has been blamed on land disputes between rival communities on either side of the border. 1600-1894 – Dahomey was an African kingdom known for its military discipline and powerful arms. Defeated by the French in 1894, it became a self-governing part of the French Community in 1958. 1960 – Dahomey gains independence and is admitted to the UN. Elections won by the Parti Dahomeen de L’Unite. Party leader Hubert Maga becomes country’s first president. He is removed by the army’s Chief of Staff, Colonel Christophe Soglo. In the next several years, the heads of state change several times. 1972 – Major Mathieu Kerekou seizes power. He remains in power until he is voted out in 1991. 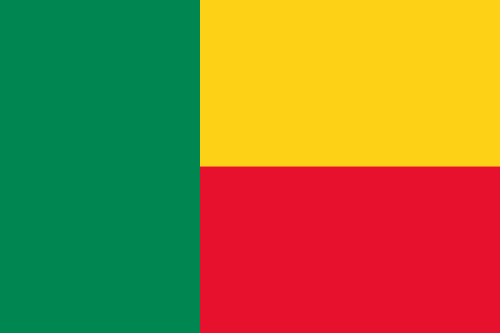 1975 – Dahomey is renamed the People’s Republic of Benin. 1989 – Anti-government strikes and demonstrations take place, continuing until 1990 until President Kerekou meets dissident leaders. Agreement on constitutional reform and multi-candidate presidential elections is reached. 1996 – Mathieu Kerekou wins presidential polls. 2004 – Benin, Nigeria agree to redraw their mutual border. 2006 – Political newcomer Yayi Boni, running as an independent, wins the run-off vote in presidential elections. The incumbent, Mathieu Kerekou, is barred from the poll under a constitutional age limit. 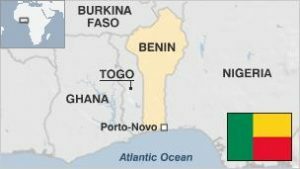 2009 – Benin announces discovery of “significant quantities” of oil offshore near Seme, a town on the Nigeria-Benin border. 2011 – Boni was re-elected in March 2011 with 53% of the vote, the first time a presidential candidate had won in the first round of voting since the run-off was introduced. In the parliamentary elections the following month the FCBE won 41 seats, narrowly missing out on obtaining a parliamentary majority. Parliamentary elections in 2015 saw the FCBE–Amana Alliancecoalition emerge as the largest faction in the National Assembly with 33 seats. 2016 – The 2016 presidential elections saw the FCBE candidate Lionel Zinsou receive the most votes in the first round, but then defeated in the second round by independent candidate Patrice Talon.